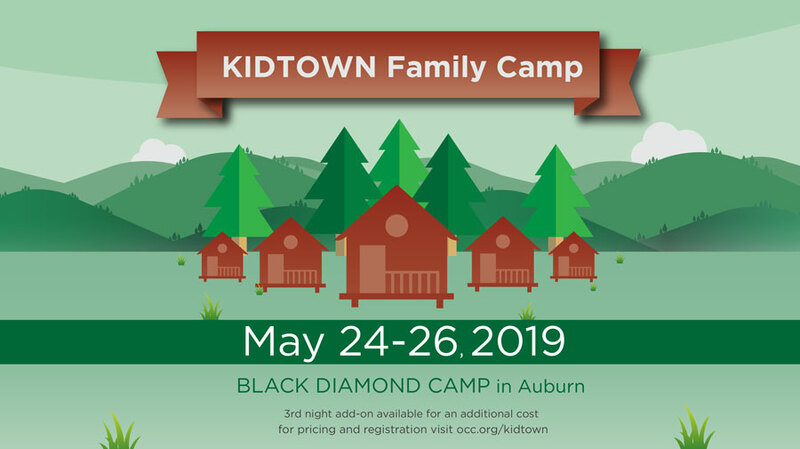 KidTown FAMILY Camp, Friday, May 24 - Sunday, May 26**. A chance to connect as a family with other KidTown families. Below is a brief intro from Pastor Phil; we can't wait to adventure together at Black Diamond Camp! Hotel-style rooms with a queen bed, one or two bunk beds and en suite bathroom. Five meals provided including a poolside luau. Archery, climbing wall, drift trikes, indoor basketball, indoor pool, zip line, and disc golf are just a few of the activities available. Amazing prizes based on family participation, theme, creativity and humor for families who creatively decorate their door. **New this Year!!! Extend your experience - add on an extra night and stay till Monday May 27th. Extra night includes additional dinner and breakfast. Questions? Email Shauna Clark for more info.